One thing that we never had a problem with the Johnson Babies was bath time. They are all water babies. Admittedly Tiny likes to spend his time stood up, but try to take him out and he screams the place down till he's allowed back in. Squeaks has always loved her baths, pre-twins she probably used to spend an hour every morning in the bath and bath crayons were her toy of choice... maybe not the bath's. As all three have grown a little bit older bath times have become more fun. Squeaks now gets herself in and out of the bath by herself so getting the boys into bed is a little easier, knowing she'll carry on playing and get out if she wants (all the doors are left open and the boys room is next door to the bathroom). When we were offered the chance to review the Flexibath Bath Toys from Whitestep I knew the little people would love them... although I feared for myself as a spectator and a parent who wants to get them back out of the bath! The first random thing to say is, I love the packaging. It's very tactile and like all good advertising it tells you what it does on the tin. 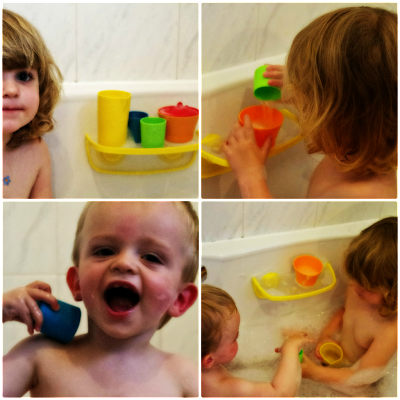 Because the best thing about these bath toys.... you don't mind that the children are putting them in their mouths... they're safe and environmentally friendly, with a list of materials which they're free from (the science bit! )- basically they don't contain the chemicals that are usually included when producing plastic. As the toys are made from a soft plastic I was glad that I hadn't provided the boys with another weapon- at the moment everything seems to be used to hit the other over the head! Fortunately, this was an enjoyable experience for mum as well as the little people. I was really impressed with how funky the toys are, and how child and baby friendly they are. Like me with the packaging, as soon as the little people saw their new toys in the bath they had to get to grips with them. Fortunately, the bath toys are based on a coffee/ tea making set with cups, a sugar pot and jug there's more than enough to share. And as a lover of coffee, I love the idea of teaching them young! Hopefully, these photos show some of the fun that was had. I love the shelf that comes with the toys, it gives a sense of focus which overcame my biggest fear- that of filling the receptacles and tipping the water onto the floor. Squeaks instantly went to work with pouring water across the pieces, and generally having fun. I really like how it seems to encourage the three sharing- even if Squeaks does have to be in charge of who's having which piece. The great thing about the set is that it's simple. It's not as bulky as other bath toys, and could probably be easily added to a suitcase so baths when you're away are as much fun (can you tell we're planning a break?!). From a target audience point of view, Squeaks at 3 loves the set, just like the play kitchen she has, the set encourages an element of role play. The boys at 17months really enjoy both 'throwing' water about and squishing the soft plastic into different shapes. And, whilst the set may seem a basic concept it does immediately engage, this toy provides an interaction which provides ongoing. At the moment this is the toy which attracts all three first everytime they have a bath, and provides them with enough stimulation throughout bath time- a definite plus in my mind. The Flexibath bath toys retail at £13.95 from Whitestep and are aimed at children from six months. Disclaimer: For the purposes of this review we received the Flexibath Bath Toy Set from Whitestep. The opinions and views expressed are entirely my own. And the sooner they all learn how to make a decent coffee, the better.